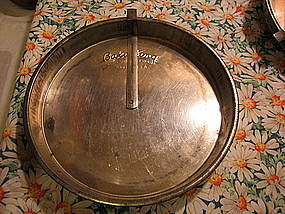 Vintage tin cake pan manufactured in the USA. There are no dents, but as with all old tin bakeware, there is some darkening. The width is 9 inches and height is 1 1/4 inches. It has the mechanism to loosen the cake for easy removal. I have a total of 3 of these pans, in like condition, available and priced individually. I need your zip code to calculate the postage.